About the film: In 1827, a group of black writers and journalists in New York who were tired of the way black people and issues of race were depicted in the press created America’s first black-owned and operated newspaper, Freedom’s Journal. Over the next 150 years, dozens of similar newspapers appeared across America, giving African Americans a voice they never had in the mainstream news media, like The Chicago Defender, The Pittsburgh Courier, and many more that would follow. 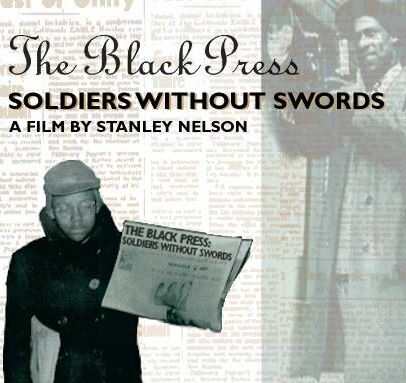 Directed by Stanley Nelson, the below feature-length documentary, “The Black Press: Soldiers Without Swords,” is really the first (and maybe the only) film to chronicle the history of the black press, including its central role in the construction of modern African American identity. From facilitating the migration of Southern blacks to northern cities, to honoring black soldiers in World War II, the black press documented people who were otherwise ignored. Reinforcing how important the contributions of filmmaker Stanley Nelson are, within the scope of American cinema (not just black American cinema), the powerful and engaging, multiple award-winning film, which is strongly recommended viewing, recounts the largely forgotten stories of generations of black journalists who risked life and livelihood so African Americans could represent themselves in their own words and images. Featuring interviews with members of the black press and newsreel footage, the film is narrated by actor Joe Morton. Watch the film via SnagFilms (parent company of Indiewire), the entire 86-minute documentary is available for you to view online for free here: The Black Press: Soldiers With Swords and View Interactive Website via PBS.